Scheerer at the 2005 press conference to announce the release of his book, “Dreams of Darkness, Dreams of Night“. Scheerer was the former Editor-in-chief of The World of Myth Magazine, and Horrotica Magazine. He was named Chief Operating Officer of Dark Myth Production Studios in 2011 as well as continuing his role of the company’s editor-in-chief. 2012 would find him retiring from the world of publishing with the final release of The Horrotica Magazine Anthology. Also that year, he became a Producer (film) of Creep Creepersin‘s new line of films scheduled for a 2013 release date. During the beginning months of 2013, Terry would take on his final creative role as a podcaster named Reaper Rick and his show News, Views and Reviews and Tree Frog Expose Cafe. Where he would gain popularity from iTunes entering in the top 100 podcasts. Terry Dean Scheerer was born, through no fault of his own, in the middle of a dark and stormy night in Carthage, Missouri, on September 26, 1949. Some may consider the fact that his birth took place during a raging thunderstorm an omen, of sorts, which may have been a deciding factor in the direction his life and resulting dark moods thus took. Born into a dysfunctional family, his life continued to follow that trend for the next eighteen (or more) years. Encouraged to enjoy literature by both his mother and grandmother, he found much more happiness living and playing in an imaginary world, than he could ever hope to find in the ‘real’ world which surrounded him. As he was an introverted and solitary child, at a young age his imaginary worlds kept him from becoming overly despondent, and he tended to be quite comfortable and happy playing by himself, in his own ‘made up’ worlds. In his youth, Terry often thought that he had been born ‘out of time’ with the rest of the world, feeling that he should have been born a few, if not some hundreds of years earlier than he was. As he grew older, he became sure of this fact. An avid reader and storyteller from an early age, he would often entertain his classmates during school recess by reciting stories he thought up on the spur of the moment. By the time he reached junior high (middle school) and high school, he often made pocket money by writing essays and doing research on term papers for other students. He also had quite a little side business going on, forging parent signatures for students who had been absent, without cause. Throughout his school life, even into college, he was an indifferent student, obtaining A’s in subjects he liked and frequently failing subjects he had no taste for, while his favorite subjects remained, history, art, literature and science. He began writing in college, but approached this endeavor as he did so many other things in his life–halfheartedly–and while he sent off a number of stories for possible publication during those early years, all he managed to collect were a series of rejection notices. Frustration with the world in general and his life in particular led to frequent bouts of depression, which began at an early age and have continued to plague him throughout his adult life (self medication experiments during college, not withstanding). 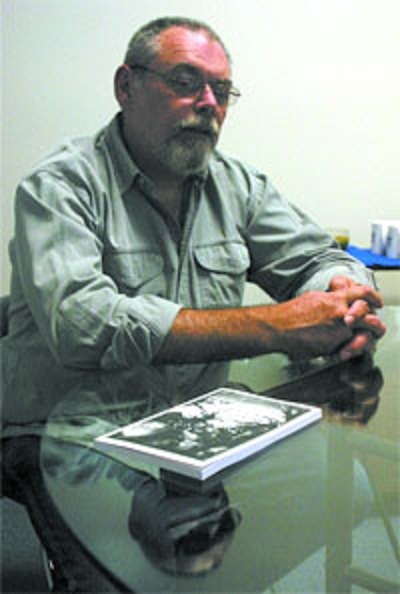 Although Scheerer had written a number of stories throughout his young life, he would not become a professional writer until the 1990s as he worked as a freelancer for various magazines. In 2003, would be his first widely distributed work for Sword’s Edge, specifically penciled a short story for the magazine, The Dragon Hunters and others to follow. His work was heavily influenced by H.P. Lovecraft Robert E. Howard and Vaughn Bode. Later, Scheerer formed a publishing company, Gateway Press. Scheerer cites his editorial experience with Gateway, and the creators he formed relationships with during that period as that which best prepared him for the later role of Dark Myth’s editor in chief. Terry D. Scheerer currently has a total of seventy-seven published writing credits since 2000. The story follows Bodkin and Smudge two medieval collectors, who primary employment is to collect dragon feces for exchange for money. In 2004, Scheerer’s “Between the Moon and Mars” was released. Arguably the best story ever written by Scheerer, where the read is propelled into a future with a pair of Astronauts returning home to Earth. Unbeknownst to them, they have brought something back from outer space that turns humanity upside-down. Scheerer won his first award in 2004 for best short story for “Between the Moon and Mars”. In 2005, Terry’s newest serial called Queen of the Westerlands found world-wide distribution in the pages of The World of Myth Magazine. This was the first part of a fantasy medieval story that begins with the death of King Harold and the disappearance of Queen Francis, their last living offspring Princess Isabelle is rushed from he home in the castle by Sir Humphrey and Squire Bruce to safety as Minister Moorcroft has taken control of the kingdom. Queen of the Westerland ran continuously for three years in 2008 and after Scheerer’s health took a turn for the worst left the magazine with his story unfinished. Although, he did return in 2009 for part 15 and finally in 2010 for the final installment with part 16, Scheerer never finished the story before he passed in 2016. After working as a freelancer for Dragons Edge, Scheerer joined the new publishing house of DANX Online Entertainment in 2004. At the time he joined it, DANX’s was about to enter a merger that would create Dark Myth Production Studios. On becoming Editor in Chief of The World of Myth Magazine, Scheerer wanted to publish younger and unpublished writers. Unlike most editors, he actively sought out promising new artists; he made his first big find in 2004 when he signed Sara St. John. In April, 2007, after Dark Myth Production Studios purchased Horrotica, LLC, Terry D. Scheerer took on the job as Editor-in-chief and ran two magazines until 2008, when he left The World of Myth. Scheerer was noted for his courtesy and thoughtfulness. He also recognized skilled writing wherever he found it and nursed along writers as few editors did. It was said that everyone in the office knew that Scheerer’s professional time has came, as he requested to the Board to publish “The Horrotica Magazine Anthology.” He had said while jump starting the magazine that his ideal last project would be the anthology. On Halloween of 2012, “The Horrotica Magazine Anthology” was released to a modest welcome as it was the first step to Scheerer’s retirement. In December 2012, Scheerer would finish his contractual obligations as the final episode of “Horrotica Magazine,” was released thus cementing Terry D. Scheerer’s retirement from the publishing world. A lifetime fan of feature films, Scheerer wanted to venture in to a new medium from him, and in 2012, Scheerer decided to try his hand in the film industry and became a producer. He is currently producing four feature films, and is working with Creepersin Films on, Paranormal Ghost Hunters Case Files: Bam the Ghost, Awesome Girl Gang Street Fighter, Creep Creepersin’s Dracula, Gritty. In 2013, Terry left the world of writing and entered the world of podcasting, when he joined the JayZoModcast Network producing two shows. One was a dark look at everything fittingly named Scheerer Darkness. The other show would be a solo act, as he took on his Reaper Rick persona in what he called News, Views and Reviews because of the fact that Scheerer would cover that week’s top news and follow up with his views on the topic and usually end the episode with a movie review. By November 2013, Scheerer’s health had taken a turn for the worst as he had become too weak to carry on and ended both shows the week of the 25th. Though Terry would pop in on different podcast shows as a guest, we would not hear from him publicly for the next three weeks. Terry would return once more under the Reaper Rick persona with his re-branded podcast (now named as Reaper Rick’s Tree Frog Expose Cafe), where he continued the same format as NVR, but added a bit more humor and fiction to his weekly shows. It was quite clear that the three week rest was not enough as he continued to miss episodes, on April 30th, Scheerer would release his final podcast episode entitled, Mystery Solved, which was episode 54. His voice was weak and cracking, but he forced his way through the show. The night following the release of episode 54, Terry was rushed to a local hospital where he spent the rest of that year. In February 2015, he would officially end his podcast career as it was announced that he had suffered a severe stroke which caused his to permanently lose his voice. In 2004, The World of Myth Magazine, asked Scheerer to work for Dark Myth in a more exclusive capacity, and contracted him to produce an on-line magazine dubbed The World of Myth Magazine. As editor of The World of Myth, Scheerer worked on a number of short stories and encouraged experimentation and used his contacts in the indie writing world to bring in new creators to the magazine. Scheerer was responsible for leading the overall strategy and execution for Dark Myth Publications and Horrotica On-line Magazine. Scheerer joined Dark Myth Production Studios in 2004 as the Editor in Chief of Dark Myth Production Studios, where he ran the publications unit, comic book production unit, and the on-line magazine for over three years. During that time Mr. Scheerer was appointed as Vice President and one a year later was awarded the title of Executive Vice President. In 2007, Scheerer was appointed COO and Editor in Chief of Horrotica On-line magazine and at the end of 2009, Mr. Scheerer was promoted from EVP to President. On May 16, 2011 Dark Myth announced that it promoted Terry D. Scheerer to Chief Operating Officer of Dark Myth Production Studios. In this position Scheerer became second in command and will also assume responsibility for the alignment and prioritization of company investments and ensuring operational excellence across the company. Scheerer lives with his wife, Patricia, in Idaho. Terry Scheerer has been semi-privately battling cancer since 2005. Also, Scheerer is the father of film director, musician, screenwriter, producer, actor and author, Creep Creepersin. It was in early 2005 when Terry learned that he had prostate cancer, at first he would continue life as normally although mentally this situation eat away at him. He and his family elected chemo therapy to battle against the disease, and after the treatment was considered a success. Although he would learn otherwise in a followup visit months after the treatment, that the cancer was in fact still there and active. For the next 10 years Terry would battle the cancer from trying to freeze it to surgery to remove it, but nothing was ever fully successful. Other than the cancer, Scheerer would find more health problems in 2010, as he was involved in a rollover car accident during a relocation to Idaho. Terry would spend the next few months healing in a local ICU from a punctured lung, broken bones and lacerations—as well, he had to learn how to walk again. Over the following five years, Scheerer continued to battle against cancer and old injuries from the accident, it appeared that another condition which he had for decades (diabetes), had gotten worse. The combination would see him struggle to lead a comfortable life, as his ailments caused Terry’s depression to worsen. On June 4, 2014, Scheerer announced on his social media account that due to a combination of his diabetes and high blood pressure, he was diagnosed with renal failure. It was during this time that he would officially announce his retirement from podcasting, after missing all four show for the month of May. Eight months later, on February 15, 2015, I was, again, announced on Scheerer’s social media page that due to a combination of his problems with high blood pressure, diabetes and renal failure, he had suffered a debilitating stroke which prevented him from ever speaking again. Terrence Dean Wall would live almost a year afterward the stroke in Apple Valley, Ca. February 2, 2016, Terry quietly and peacefully died in his sleep at the age of 66. Leave your comments or memories of Terry D. Scheerer.